This Tiffany Bridal Shower post is courtesy of our contributor Carolyn…I met one of my best friends Chantelle quite a few years ago here in Alberta, but it took us living in the same city, (Regina, Saskatchewan) far from our closest friends and family to really bring us together (consequently this is the same beautiful city I met the talented and forever thoughtful owner of this blog)! Last year Chantelle asked me to be one of her four bridesmaids and I couldn’t be any happier to support and represent her on one of the happiest days of her life…who am I kidding, the chance to help plan a party or two was quite enticing as well! Chantelle and I share a few traits but our favorite one is frugality. 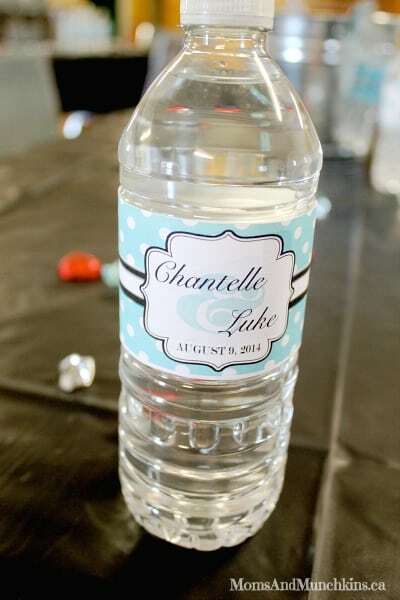 So it was important we plan a special yet inexpensive wedding shower for her! 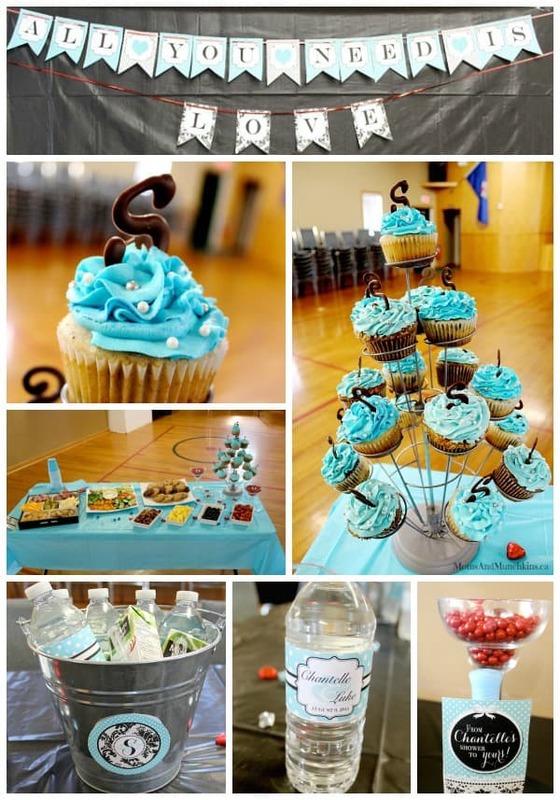 We decided to throw Chantelle’s wedding shower at a small town community hall. The price was right but we needed to take attention away from the floor curling lines. 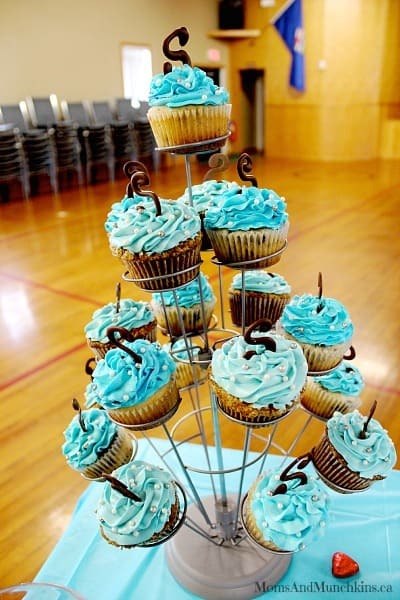 With the help of Just a little Sparkle, and a few trips to our local dollar store and party store, the décor for the party was kept under budget and loved by our guest of honor. We bought plastic black table cloths, plastic diamonds and metal beer buckets from the dollar store. Our bride requested NO center pieces but we knew we needed something so why not make the table décor functional! 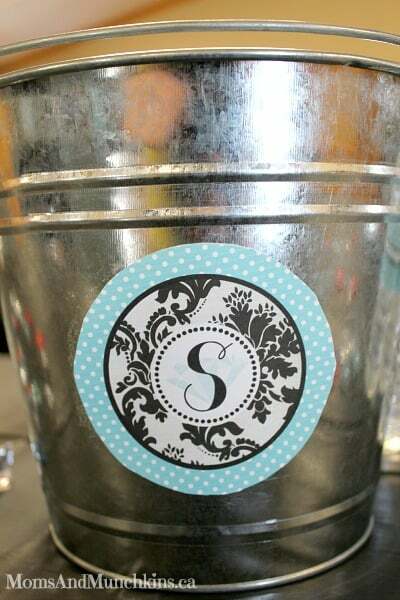 The beer buckets were decorated with a monogram made by Just A Little Sparkle and the diamonds were spread around the table! 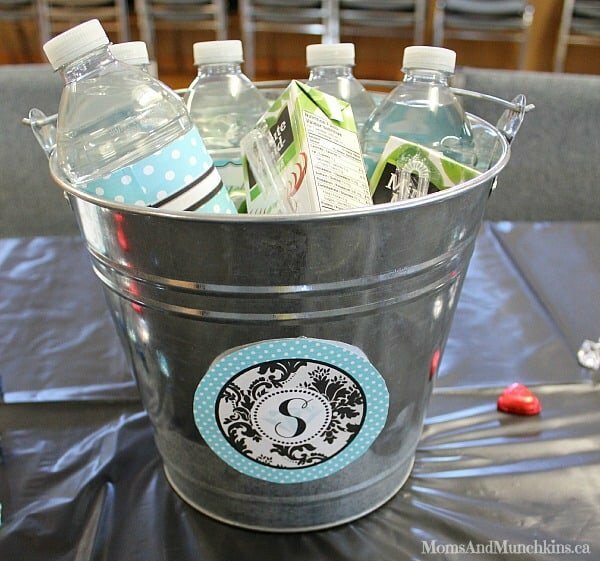 We filled the buckets with ice and put juice boxes and water bottles wrapped with beautiful labels also provided by Just A Little Sparkle on the ice. It was easy and still looked chic! 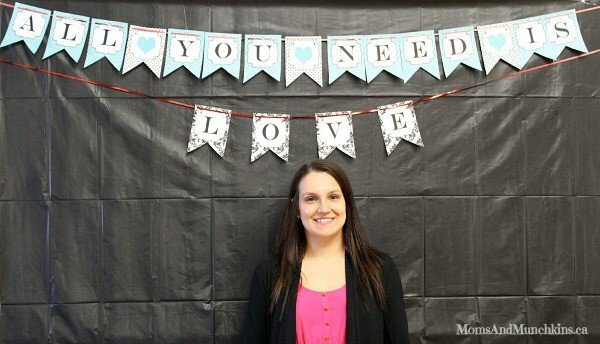 We wanted to make a photo booth to take pictures for her guest book and decided to throw up a plastic table cloth with a lovely LOVE banner. I don’t think I would use a plastic table cloth again but I will use the banner again. Bride-to-be Chantelle also said she just wanted time to catch up with her loved ones, no games, just eating and talking, and drinking champagne of course. Instead of games we asked Just A Little Sparkle to create cards the guests could fill out. The cards included memories of the bride, advice for the bride and groom, and date ideas for both at home and out of the house. The cardstock the cards were printed one was purchased at the dollar store. 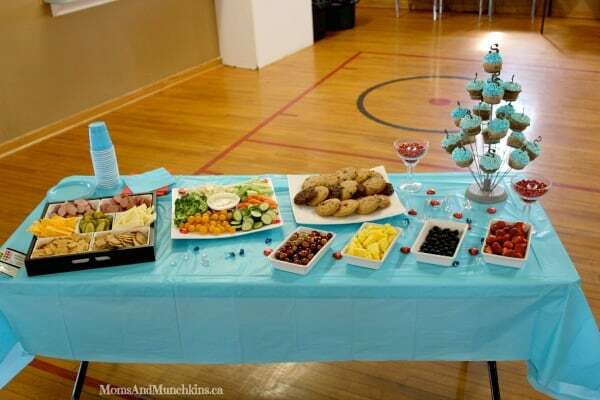 We planned the shower for after lunch and before supper to save on food and beverage expenses. Instead of buying pre-made trays of food we bought the food separately, prepared it the night before and put it on serving platters borrowed from a friend. We figured we saved about $25 doing it this way! 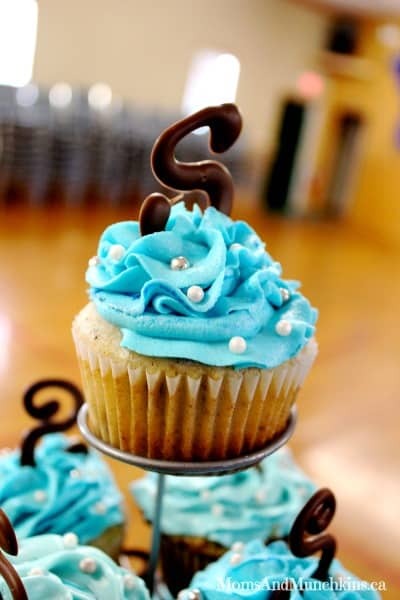 A good friend of mine, Cindy at Crème De La Cakes, made beautiful cupcakes in two different flavors and was open to all my crazy requests, including chocolate monograms! 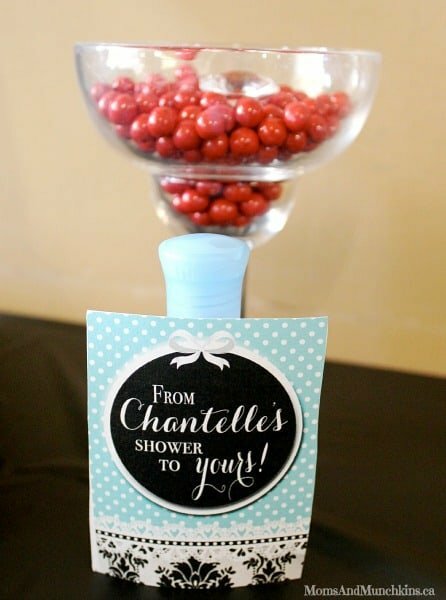 We found the idea on Pinterest for the saying “From Chantelle’s Shower to Yours” on favor tags and put on bottles of shower gel. This may have been one of our biggest expenses but everyone loved the gift! Thank you to Chantelle for being so easy to plan for, Just A little Sparkle for all the printable party supplies, my fellow bridesmaids for being so fun to work with, Crème De La Cakes for the delicious cupcakes, and everyone else who made the day special for the beautiful bride! 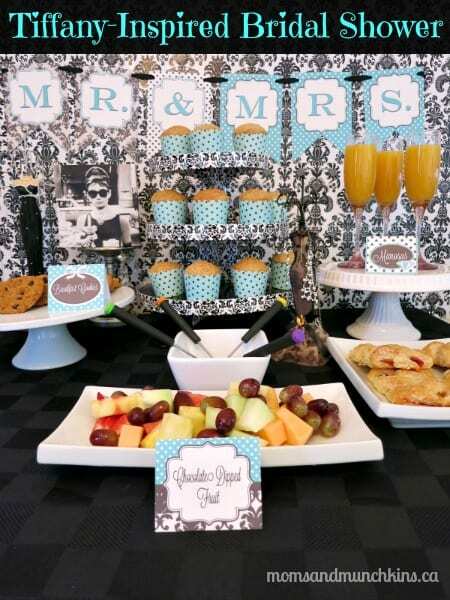 For more Tiffany-themed Bridal Shower ideas, visit our post on Breakfast At Tiffany’s Bridal Shower.